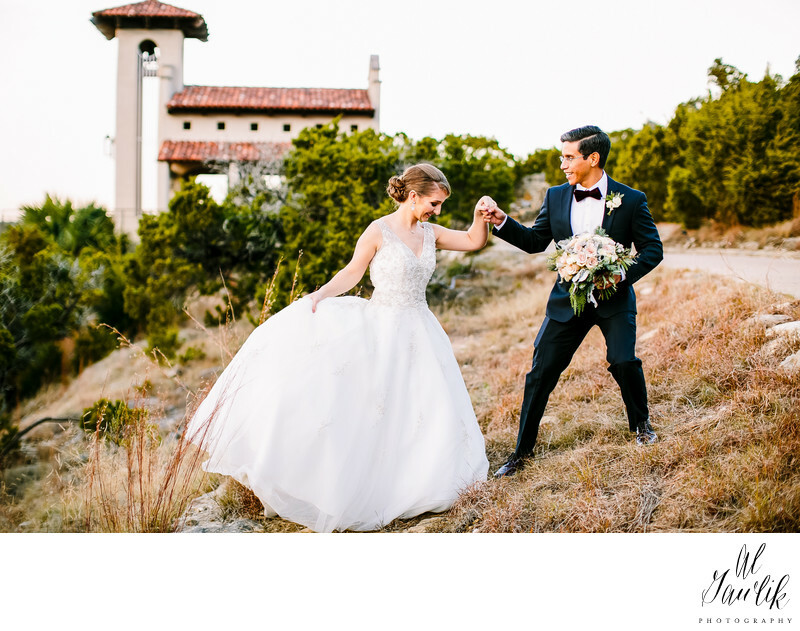 Charming, tuscan style chapel that offers couples a free place to get married in the Texas Hill Country.The Chapel Dulcinea is a very popular venue about 15 miles southwest of downtown Austin. Located about halfway between Austin and Wimberley, TX, it is an interesting spot with a fantastic view of the surrounding hill country. The chapel resides at the top of a cliff, which makes it very attractive for photographers and event planners. You can schedule both wedding ceremonies and photo shoots at the Chapel and the best part is it is a FREE venue! You get your entire deposit back following your use of the facility. The chapel itself is a part of the larger Wizard Academy, which is a campus dedicated to education and recreation. Visitors from around the world have visited the site for weddings, photo sessions, and to attend seminars and classes at the campus. Self-described as a “summer camp for adults”, one can expect a lively atmosphere and friendly company. Construction on the Chapel, the campus’ first structure began in 2005 and the dedication of the building was held on April 23, 2005, in the spirit of honoring two historic writers, Miguel De Cervantes, author of the literary favorite, Don Quixote and William Shakespeare, who brought us the riveting story of Romeo and Juliet, among countless other titles. In fact, April 23, 2016, marked the 400 th anniversary of when both of these historic writers would pass away on the same exact day. Certainly a bittersweet remembrance, but the administrators of the campus and chapel remind us that the building was erected in fond remembrance, and that holding your wedding and ringing the chapel bell at the conclusion of ceremonies promises good luck and happy trails for all that visit. The name sake of Dulcinea is interesting as well. In the heart of literary romance and affection, Dulcinea was an ethereal character in the book Don Quixote, who functioned as an unseen mythological muse. The main character certainly believed her to have existed, and would do anything for Dulcinea with her unparalleled magnificence—a queen and lady with hair of gold, cheeks of roses and a goddess-like beauty to which none other could compare. The Chapel Dulcinea has indoor seating for 12, and an extended indoor capacity of 30 for people who don’t mind standing. Outside the chapel is room for another 60 people to stand and view the chapel ceremonies. In all the facility can manage a party of about 80-90 persons, and also has parking available a short walk away from the chapel for about 20 vehicles and there is overflow parking a bit further if your ceremony has a large attendance. There are also three nearby choices for receptions, so you are all covered if you choose to hold your special day at the Chapel Dulcinea!